Flowers invoke mindfulness. Thus the phrase, "Stop and smell the roses." Their beauty and fragance can stop us in our tracks. Ever go on a walk with a toddler? Chances are they stopped to look at each flower along the way. I like to encourage mindfulness by having each child hold a flower (stay away from thorny stems like roses). We gaze at the flower in silence for an age appropriate amount of time. I find that the longer that you look at the flower, the more colors and textures you notice. I discovered this when I was lucky enough to get a massage in French Polynesia- the therapist put a hibiscus flower in a vase on the floor under the head rest, so for an hour I gazed at the flower. At first it was just a red hibiscus, but then I started to see variations of colors and textures that I never would have noticed if I'd just walked past it. So, ring a bell to start the flower meditation, have a period of silence, and then ring a bell afterwards. Ask the children what they noticed about their flower. If your flowers are fragrant (which I recommend), do a "breathing exercise". Take long deep breaths to smell the flower all together as a group. Discuss. There are lots of fun things you can do with the flower while on the floor too. Ask again for kids ideas! You can send the flowers home with the kids. OR I bring in a vase or mason jar, and suggest to the kids that we put all of our flowers together in the vase and give it to someone that might appreciate it (teacher at the school, someone's parent that just had a baby, or the owner of the studio, etc.) It's fun to see who they come up with to give it to. If they can't all agree on one person, then ask each child to give their own flower to someone of their own choosing. I love using props in kids yoga, and I especially like when a "prop" is from the earth and biodegradable... 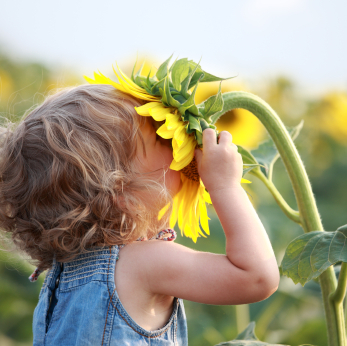 Remind them to put the flower in their green garbage bin or compost bin if they are taking the flowers home. Using flowers helps bring a connection with the earth into the classroom or yoga studio, and it is fitting for the week of Earth Day! Make sure that the flowers you bring in aren't poisonous or prickly.... I like picking out flowers with rigid stems (Think sunflowers over tulips) so that they stay straight during our poses. If you are just doing mindfulness exercises and not asana with the flowers, then choose beauty and fragrance over sturdiness! Also, if you have too many kids in your class to make flowers feasible, a single flower or a small potted plant is a nice addition to the center of a circle of mats and creates a good focus point for meditation and balancing. Have a wonderful time using flowers in your class! And take some pictures!